The Duchess of Sussex (ie. Meghan Markle) attended her first Trooping of the Colour at Buckingham Palace this morning, taking part in the carriage procession with the royal family. 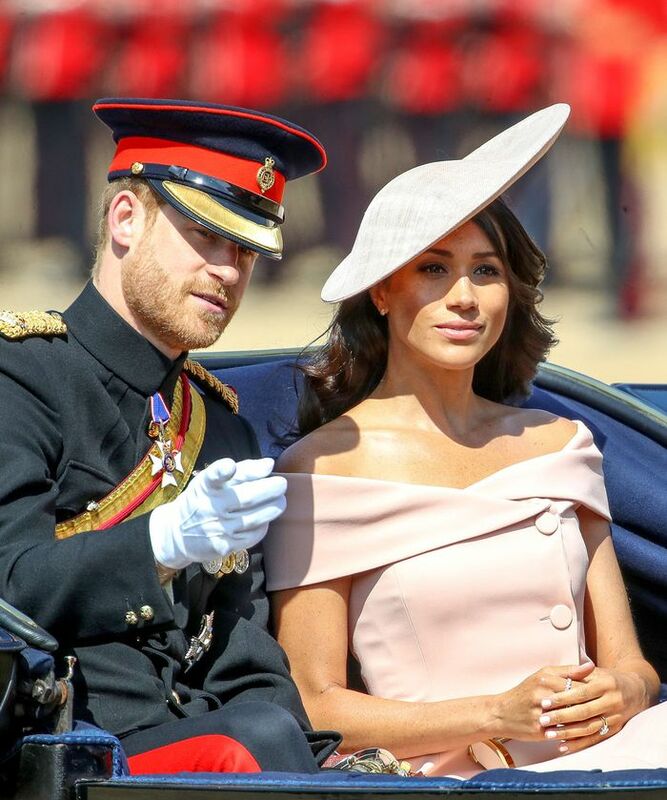 Meghan leaned on an American designer for the occasion, wearing a custom pale pink fitted dress by Carolina Herrera with a matching hat by Philip Treacy. We can expect a spike in searches for off-the-shoulder dresses today, as Meghan's dress has an elegant Bardot neckline and buttons to the left of the bodice. The Duchess of Cambridge once again leaned on British designer Alexander McQueen for her Trooping of the Colour outfit, wearing an ice blue dress with a very 2018 square neckline. Keep scrolling to see the Trooping of the Colour outfits. On the Duchess of Sussex: Alexander McQueen. On the Duchess of Cambridge: Alexander McQueen.